Network Speed Test for Windows Phone is a minimal UI app but is quick and efficient at what it does: Test your network speed connectivity. It also gives you more detailed information other apps don’t and at a price (free) that is hard to beat. There are times in life were we just need to try to understand why… why!… your WiFi connection on your Windows Phone is so slow. It’s not your fault, usually, but it happens. This is particularly true if you are out and about slurping up free WiFi from your coffee shop, hotel or other public locations because, let’s face it, you and everyone else are doing the exact same thing. Enter Network Speed Test for Windows Phone. Network Speed Test is a free app from Microsoft that allows you with a single tap of your Windows Phone screen to see what your download and upload throughput are to your device along with other important, if not more technical, tidbits of network information. It’s quick, simple and will answer the mystery of why the Interwebs are a crawl at your favorite hangout. first glance. Dominating the center of the app is a dial with a Start button at the base of the dial. Tap that Start button and the app immediately begins testing the download then the upload speed of your WiFi or GSM connection. The dial then will start to fill up to the connection speed of your download and upload speed. In all it takes about a minute to run the test. After the initial download and upload speeds are tested, Network Speed Test then measures other aspects of your connection. It measures network jitter (the variation in time of when packets arrive to your Windows Phone), network delay (commonly referred to as latency) and Packet Loss percentage (how often packets get lost in transmission and have to be repeated). As a general rule you want all three of these to be low as they all impact network performance. Put another way, you can have great download speeds but if your packet loss is high, it degrades the perceived speed of that connection as packets are having to be re-transmitted. There, your networking lesson for the day achievement unlocked. 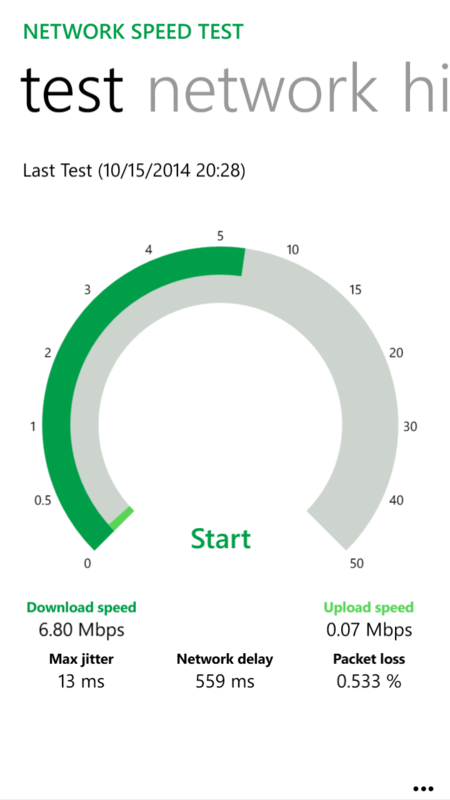 In addition to the test itself, Network Speed Test for Windows Phone shows you the history of all of your tests and what type of connection was tested at that point (GSM/Cellular or WiFi) so you can see how your connections have performed over time. There is not a lot to Network Speed Test but then again, there doesn’t need to be frankly. It does what it is suppose to do in an elegant, minimalist way that can help you identify network issues at home or on the go quickly.